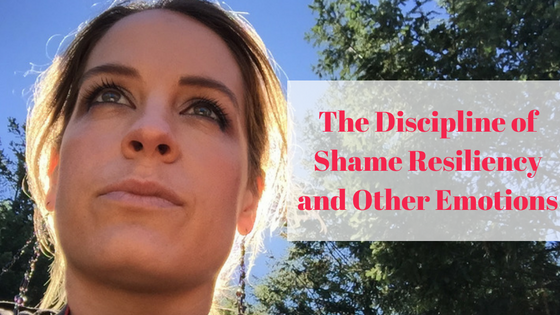 So many of you responded back to me that you have experienced similar stories of feeling ashamed too, whether from being caught binge eating yourself, or shamed for your athleticism (or lack thereof), or shamed for your body. We all know it doesn’t take much to feel shame in our world. All it takes is the devil twisting the words of someone close to you to make you start telling yourself, “I’m not good enough” or “I’m bad.” It’s never about feeling guilty for bad behavior, it’s about feeling inadequate as a person. But, as I shared in my reflection, these stories of our past and odd memories that pop-up I believe are gifts from God.They serve as teachers to help us rewire the TRUTH of who we are through Christ. Brene Brown calls this “shame resiliency,” it’s all about rising above the shame-based thoughts. She points out that resilience is the only win here, because there is no such thing as shame resistance. Our human, sinful nature and others impacting us will always keep feelings of shame knocking on our door. But practicing resilience, through the power of vulnerability and being willing to open up these stories to God and others who can help, will make us stronger and wiser for it. Avoidance simply keeps us spinning. If only it were that easy. No, we have to find a way to continue to practice shame resiliency, which is really all about practicing emotional discipline. 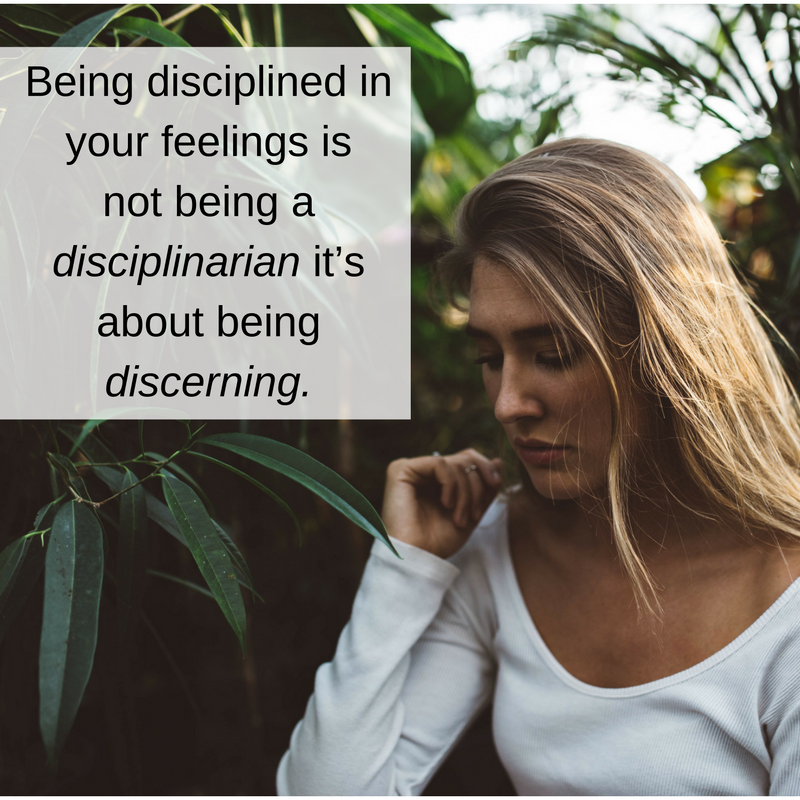 I hadn’t thought about our emotions as something we need to actually discipline in our lives until I started creating the 6-week Bible Study on Spiritual Discipline that begins January 9 (there’s still room to join, if you’re interested, click here). Becoming shame resilient is actually a discipline that you need to practice in order to be emotionally mature and stable. Emotional stability is so incredibly important to your purpose and call from God. If you fall prey to the whims of your fleeting feelings, you will be prey to the distractions that keep us from your destiny. So, I wanted to open up the discussion of what it means to be emotionally disciplined and 3 things you will need to ask yourself regularly to start putting this discipline into practice. First, being disciplined in your feelings is not being a disciplinarian it’s about being discerning. It’s not about invoking your inner critic to “stop feeling so much” in an effort to make you more stoic, logical, or controlling. Nothing could be further from what God desires for you. The very fruits of the Spirit are ripe with emotion! You can’t experience the fullness of your Spiritual self without emotion. Now, I understand why we do this. We think we can force a feeling, but we can’t. And when we realize we can’t force a feeling we think our only other choice is to “shut down” or “numb” our feelings with things like food, alcohol, drugs, or the thrills of chasing things like “success” or devious behaviors. All of this is self-protection from that monster in our mind. Rather, being emotionally disciplined is all about your discernment. It’s not about trying to change or judge your feelings but simply recognizing your feelings and discerning if they are based in truth or in fear. Q1: WHAT AM I FEELING RIGHT NOW? Q2. WHAT EXACTLY AM I THINKING RIGHT NOW? Our own thoughts create our feelings, not other people or circumstances. So get quiet, breathe deep, and write down the actual thoughts racing through your mind. Q3. ARE THESE THOUGHTS TRUE? You will need to use the Word of God and the power of the Holy Spirit within you to test your thoughts against the Truth of who God is. Your feelings are always valid, but the thoughts you are believing could very well be lies. Test your feelings and thoughts against who you are in Christ and see if this doesn’t offer greater peace. Q4. WHAT IS MY PRAYER? If you have time to worry about something, you have time to pray about something. Maybe someone did really hurt you and you are struggling with that. Well, here is your chance to surrender it to God and let Him handle changing them, because frankly, you can't even if you tried. Pray through it and you will receive the power and peace that only God can grant you. Now, this is where the discipline comes in— willing to actually DO THIS stuff. You know what they say about change right? You won’t change any behavior about yourself until the pain of staying the same becomes greater than the pain of change. In other words, there is going to have to be a “come to Jesus” moment when you realize your feelings aren’t your ALLY but are much closer to your ENEMY. More often than not, if we are experiencing painful relationship patterns, painful work patterns, or painful health patterns, our emotions are a significant reason for our pain. Our emotions sabotage us. Identifying your feelings as the culprit is incredibly hard because we often confuse our feelings with our identify. In fact, you can get so used to your shame that it feels like it’s a part of who you are. I’ve heard countless people tell me, “It’s just the way I’m wired,” when in fact what they are suffering from is often in direct violation of Who God is and the image from which we came. So, here is where some study, accountability, and a safe place to seek some relief and resiliency might be exactly what you need in 2017. Like I said, we are doing a 6-week Nutrition course that corresponds with this 6-week Bible Study on Discipline. Buuuuuut, if you’re not interested in the nutrition course (The Daniel Challenge) but ARE interested in doing the Women’s Bible study on Discipline, that’s now an option as well! The Daniel Challenge and Nutrition Course is $97 (which includes the Bible study for free) and then Discipline Bible Study & Course by itself will be $30, just to cover the cost of the materials purchased and workbooks you’ll receive. You can buy the Bible Study by itself here. I hope this insight helps you think through what emotions you need to discern into discipline this year. I'd love you to comment and tell me the #1 emotion you think tortures you the most! Ready, Go! Ready to up your nutrition & spiritual discipline in the New Year? 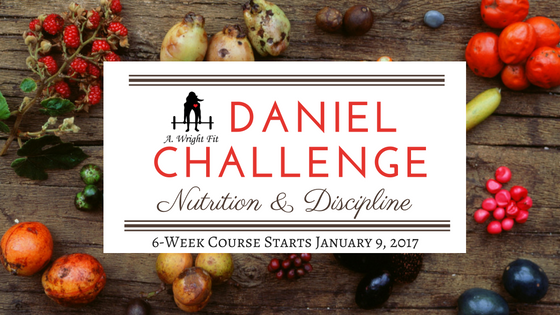 Join the A. Wright Fit Daniel Challenge, a 6-week Nutrition & Discipline course and Bible study that starts on January 9! This course is a small-group format of like-minded women who are ready for FOOD FREEDOM in 2017! As a group, we will be challenging ourselves to a 7 to 21-day Daniel Fast for the first 3-weeks of the course and then transitioning into the Nutrient Based Eating program, the signature nutrition program of Certified Nutrition coach, Amanda Wright! Every week, we will also be meeting online for a small-group Bible study all on Spiritual Discipline! We will dive into the Biblical principles of becoming more disciplined in the areas of: prayer, time management, health and exercise, organization, finances, and our emotions! This group will be on Zoom every week and you will be given a daily Bible study format to follow! If you are interested in learning more or purchasing the program, you can visit this link HERE. If you have any questions, feel free to reach Amanda directly at amanda@amandawrightfit.com.